An image of the models used in the animation. In 2000, a year after Toy Story 2 came out, Pixar made two awards-related animations featuring characters from Toy Story 2 dressed in formal outfits. The first was for the 2000 Oscars, while the other was for an award Jessie received herself. She was honored with the Patsy Montana Entertainer Award by the National Cowgirl Museum and Hall of Fame, an award named for Patsy Montana that recognizes those whose work in the entertainment field continues the tradition of the cowgirl. 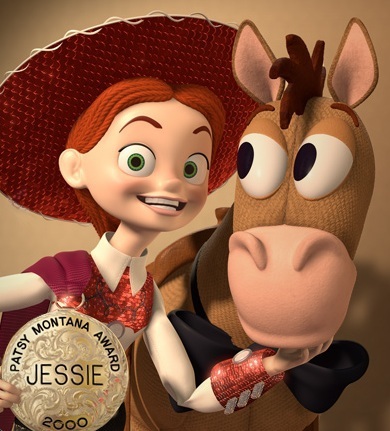 For this award, Pixar prepared an animated speech for her that would play at the National Cowgirl Hall of Fame’s Annual Induction Luncheon on November 10th, 2000. It featured her and Bullseye, and according to two articles, it can be assumed she specifically says "Yee-haw! I am just pleased as punch to be receiving this honor in memory of the original yodeling cowgirl, Patsy Montana." in the full video clip. An excerpt of this speech can be found in Victor Navone's Pixar Training video, but he claimed that he doesn't have the full video, nor knows where to find it. In addition, the "Reel Cowgirls" exhibit at the museum and official website both no longer have the animation. 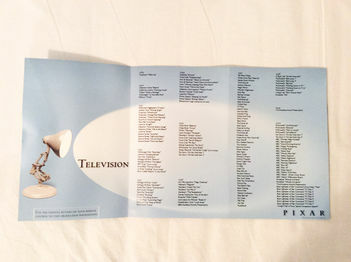 Whether it was actually broadcast on television or not, a copy is known to exist on the Pixar-employee-exclusive Made in Point Richmond DVD under the "Television" section. On May 21st, 2018, LMW user jarets35 (also known as Ayeayematey in the LMW Discord server) uploaded the full video of the speech to YouTube from his copy of the Made in Point Richmond DVD. Victor Navone's Pixar Training video containing an excerpt of the speech (0:49 - 1:05). Full video of the speech, from the Made in Point Richmond DVD (found by Ayeayematey). Made in Point Richmond DVD insert. 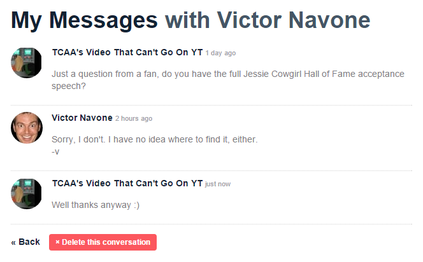 The conversation with Victor Navone about if he had the full clip. ↑ The Free Library's article on the acceptance speech. ↑ Lubbock Online's article on the acceptance speech.